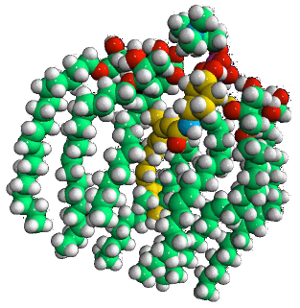 Lym-X-Sorb® monomer complexed (in a conceptual model) with a molar equivalent of fenretinide, in yellow. Drug is soluble in Lym-X-Sorb® at 1:1 molar ratio. Drug in excess of 1:1 molar ratio remains as a solid. 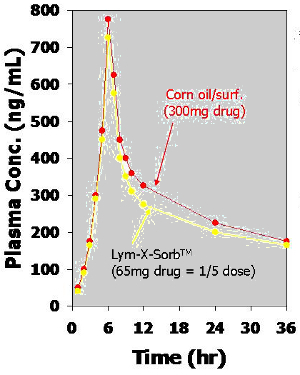 Lym-X-Sorb®/drug formulations are stable at 40°C for 6 months. Drug remains a suspension in corn oil/surfactant formulation. Drug in corn oil/surfactant (suspension): Estimate 12-15% absorption in fed dogs or in humans who received a high fat meal. 80-90% in humans who received the same high fat diet as above. Cyclosporine encapsulated in Lym-X-Sorb® was compared to the current delivery formulations of cyclosporine and administered orally to dogs. The area under the curve showed a 4-5 fold increased absorption of cyclosporine in Lym-X-Sorb® formulation when compared to the commercial formulation. 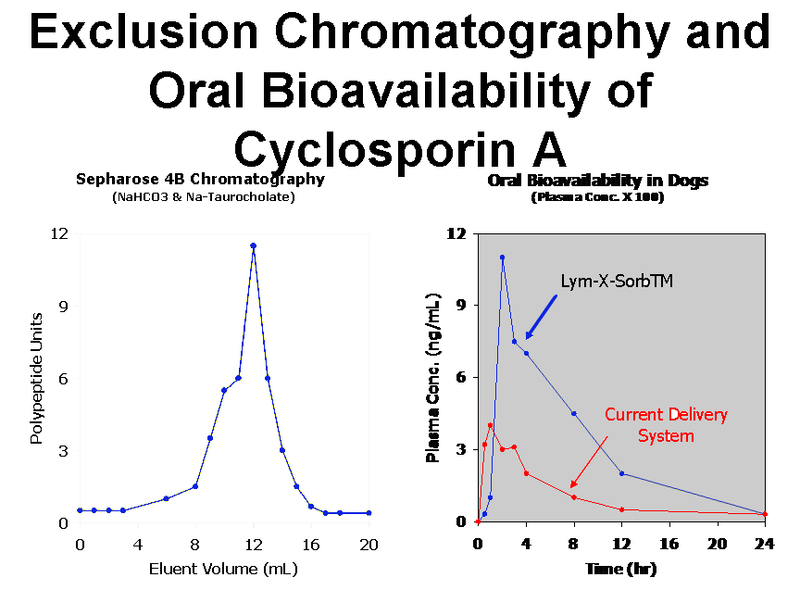 The delayed appearance of drug in plasma for Lym-X-Sorb® formulation indicates that cyclosporine partitions with the chylomicrons into the lymphatic system.